Artificial intelligence (AI) has long been a thing of imagination, one of Hollywood’s favorite themes for blockbusters. Perhaps they were being fueled by ongoing research, or vice versa – researchers were inspired by fictional visions. Whatever the case, we have lived to see the day when the fantasy became reality. In fact, the technology is being populated on such a scale, that the global market revenues are expected to grow from 7.4 billion U.S. dollars in 2018 to 89.85 billion in 2025. North America is set to account for the majority of those revenues, with Asia Pacific and Europe battling for the second spot throughout this period. As representatives of these three regions, the United States, China and the United Kingdom were already in the lead in terms of AI companies’ concentration in early 2018. Regardless of Hollywood’s vision, artificial intelligence application is not limited to robotics and manufacturing, but it also finds use in more subtle areas such as predicting customer behavior, monitoring social media interactions and tailoring promotions. In general, marketers around the world found two basic purposes of AI: data analysis and, based on the results, task automation. In fact, with the growing focus on customer data, roughly half of global marketing professionals have adopted AI to help with data analysis. Further applications include marketing personalization, audience identification, e-mail campaign automation, customer service automation, just to name a few. All in all, AI and machine learning is perceived as one of the most effective digital marketing techniques. As the use of AI technology in marketing is still in its infancy, it comes as no surprise that many of industry professionals are not yet entirely convinced of AI’s influence on advertising performance, and as such are not yet comfortable with automating anything other than select stages of their campaigns. 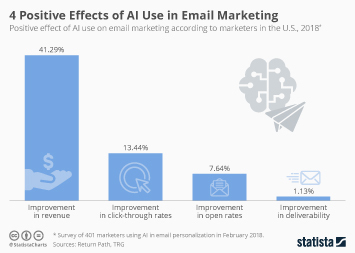 Marketers are also in need of detailed overview of costs as well as data and algorithm usage related to AI-run processes. In other words, the industry doesn’t seem to be ready to cease control over their work in favor of artificial intelligence. Nevertheless, the common view is that the technology is an important trend in the advertising industry.